Manchester (UK), 29th May 2018 – Digital Projection, A Delta Associate Company and the undisputed leader in laser projection, will launch a total of four new projectors across three ranges at this year’s InfoComm (6 - 8 June, Las Vegas, USA), on booth C2018. 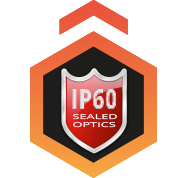 Alongside the projectors themselves, the co-inventor of DLP technology will unveil two new innovations: IP60-rated 100% sealed optics as well as its proprietary ColorBoost + Red Laser technology. 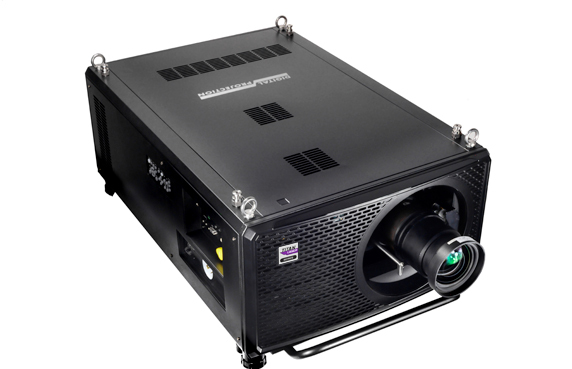 Digital Projection is proud to announce the arrival of the brightest ever 3-Chip DLP laser phosphor projector to the market: the TITAN Laser 37000. Boasting 37,000 Lumens, the TITAN’s singularity amongst 3-Chip laser projectors is further distinguished by the utilisation of the most advanced 100% sealed optical engine that uses liquid cooling with radiators to remove energy to the outside environment.. Structured within Digital Projection’s 1-Chip range of DLP laser projectors, the new ColorBoost + Red Laser technology is an intelligent processing innovation to deliver the most accurate colour reproduction, bringing performances ever closer to that of 3-Chip DLP projectors. The use of red lasers, coupled with a specially-designed colour wheel, assure no loss of brightness and enable projectors to produce more vivid, saturated and life-like images than has previously been possible. The resulting colour gamut guarantees the projector will achieve at least the REC709 standard. Featured centre-stage on Digital Projection’s stand, the TITAN Laser 37000 is an impressively bright and powerful laser projector, ideal for the most demanding large-venue applications. Where bright, pin sharp images are required there should be no compromise and TITAN delivers from a relatively compact chassis. The class-leading 3-Chip DLP projector boasts the very latest in connectivity, including DisplayPort, HDMI 2.0 and HDBaseT, and is packed with features such as Constant Brightness Control and DMX Art-Net compatibility. 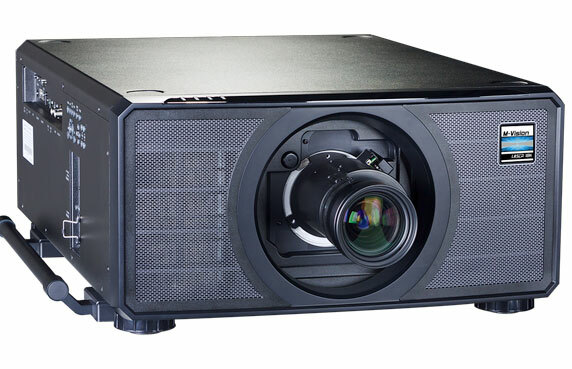 The TITAN Laser 37000 is uniquely placed in the market as the brightest 3-Chip DLP laser phosphor projector and boasts 100% sealed optics, as well as utilising liquid-cooling with radiators to remove energy to the outside environment. Its optical system – from the laser light source up to the lens – is completely sealed and rated at IP60. This ensures that light output and colour performance will not be degraded due to the ingress of dust. While the sealed optics and laser phosphor technology already minimise maintenance, the system is also liquid-cooled via a radiator heat exchanger to create a filter-free projector, bringing it to a virtually non-existent cost of ownership. Alongside the newly launched M-Vision Laser 21000 and E-Vision Laser 13000 WU, the ground-breaking IP60-rated sealed optics are also available on a range of Digital Projection’s single chip DLP laser projectors, including the E-Vision Laser 10K, WQ120, 8500 and 4K-UHD. Unveiled at this year’s InfoComm, the Digital Projection M-Vision Laser 21000 WU boasts an unprecedented 20,000 lumens output and a 10,000:1 contrast ratio, to bring budget-sensitive applications a large-screen imaging solution and near 3-Chip performance at a 1-Chip price point. The lamp-free, laser-phosphor projector is charged with ColorBoost + Red Laser technology to provide the most realistic and saturated colours at previously unimaginable luminance levels. Venues needing a powerful yet budget-conscious large-format imagery solution without sacrificing on colour accuracy, as well as those contending with ambient light, will directly benefit from the M-Vision 21000’s class leading light output, contrast ratio and colourimetry. Its DisplayPort accepts frame rates up to 60 Hz and HDMI 1.4b for Side by Side, Frame Packing & Top Bottom 3D formats. Motorised shift, zoom and focus across the whole lens range offer extra flexibility and ease of setup. Building on the run-away success of the E-Vision Laser 10K, which has earned it’s reputation as a robust, compact and reliable workhorse, the E-Vision Laser 13000 WU has been updated with all-new ColorBoost + Red Laser technology as well as 100% sealed optics. Borrowing advanced graphics processing from Digital Projection’s flagship 3-Chip projectors, the E-Vision Laser 13000 comes as standard with HDMI 1.4b, Display Port and HDBaseT connectivity, while accepting both commercial and domestic 3D signals. With projector automation, central control via a PC based application as well as edge blending and geometry correction, this powerful and compact single chip DLP laser phosphor projector is set to be another class-leading product for Digital Projection. At the show, the company will also launch its E-Vision Laser 11000 4K-UHD. Boasting increased brightness at 10,500 Lumens alongside 4K UHD resolution (3840 x 2160), this near-maintenance-free laser phosphor projector is also IP60 rated thanks to its 100% sealed optics. With so much innovation to take in, make Digital Projection’s C2018 booth your first stop at InfoComm 2018.